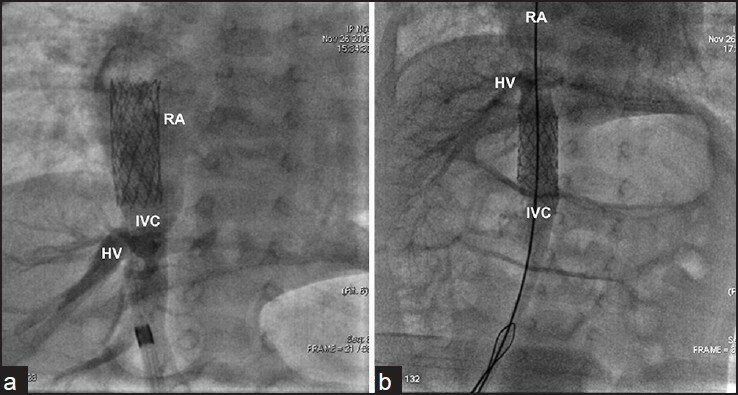 Atrial septal stenting was advocated as one method among the various surgical and transcatheter techniques of providing a reliable and predictable interatrial communication. This review discusses the indications and procedural details of atrial septal stenting. 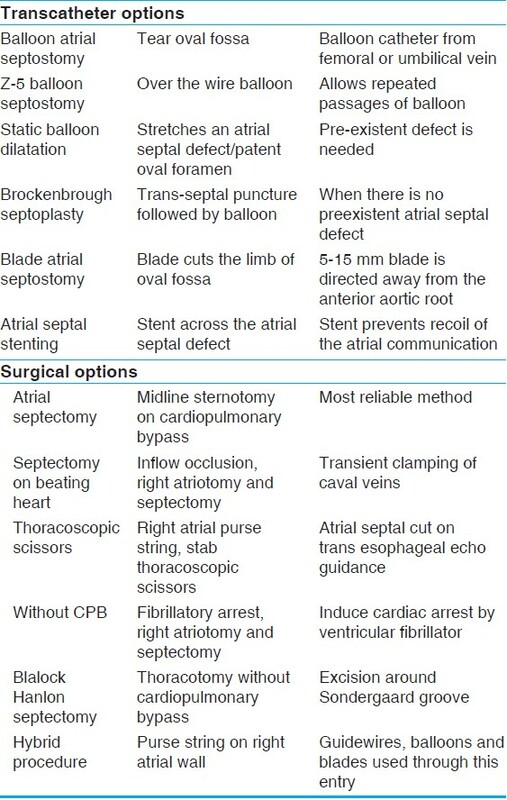 The different procedural risks of atrial septal stenting in various ages and anatomy should also influence the cardiologist to choose the most appropriate alternative option listed in [Table 1]. The hemodynamic benefits of an atrial septal defect may vary in different situations. Intact atrial septum or very restrictive oval foramen in patients with hypoplastic left heart syndrome, leads to severe pulmonary venous hypertension, supra-systemic pulmonary vascular resistance, and severe hypoxia. The resultant pulmonary lymphangiectasia leads to irreversible lung changes and may even contraindicate a neonatal heart transplant. If post tricuspid shunts coexist with mitral stenosis, reflex pulmonary arteriolar spasm due to pulmonary venous hypertension will reverse the shunt and lead to aortic desaturation. In such patients, atrial communications will improve their operability by reducing the pulmonary vascular resistance. The procedure is commonly done from right femoral vein, which allows a straight passage to the oval fossa. Left femoral venous access gives a sharp angulation between the left iliac vein and inferior caval vein and poses difficulty for trans-septal puncture. Umbilical venous access is almost never used for two reasons. Umbilical vein obliterates due to fibrosis after the first few days after birth making it unavailable. The tortuosity from the umbilicus to atrial septum through the venous duct and left hepatic veins poses difficulty for stenting. Transhepatic access is an alternative if femoral veins are occluded or inferior caval vein is interrupted. If no vascular access are available, hybrid surgical access through a double-layered hemostatic purse string suture around the right atrial wall after limited thoracotomy or sternotomy may be required. Atrial septal interventions need an access that will be perpendicular to the plane of the atrial septum. Since jugular venous access never achieves a perpendicular access to the atrial septum, it is seldom used. Detailed hemodynamic pressure data recording is very vital to guide further steps in patient management. An arterial line helps to monitor the periprocedural aortic pressures, document the severity of hypoxia, and acidosis, enable correction of the electrolyte imbalance and guide ventilator settings. In patients with very small left atrium, angiogram is done in the right pulmonary artery to delineate the contours of the left atrium on the levo-phase. If biplane fluoroscopy is available, this levo-phase is recorded on lateral view too [Figure 1]. This contrast injection is avoided in patients with pulmonary edema, renal failure, severe metabolic acidosis, or compromised hemodynamics. A 0.032" J tipped guidewire is parked in the left innominate vein through the right superior caval vein and a transseptal sheath is advanced over it. Left innominate vein may be absent if there is a persistent left superior caval vein entering the right atrium through a dilated coronary sinus. In such instances, the sheath tip is parked in the right jugular vein. A 0.021" tipped pediatric Brockenbrough septal puncture needle is introduced under fluoroscopic guidance till its tip reaches the end of the transseptal sheath. The arrow of the flange of the needle should point posterior and to the left at 4-5 o' clock position. The transseptal sheath-needle assembly is withdrawn down towards the right atrium till the tip of the sheath passes the limb of oval fossa, as recognized by appearance of atrial ectopics. During septal puncture in adults before balloon mitral valvotomy, the tip of transseptal catheter is pointed posterior to a pigtail catheter in aortic root. However, most clinical situations like hypoplastic left heart syndrome and univentricular hearts with malposed aorta will preclude any catheter positioning in the aortic root. So placing a catheter in aortic root to guide the needle tip is not mandatory for septal puncture. Staining the atrial septum is often done with small injections of contrast to guide the site of puncture. It is useful to guide the septal puncture site with transthoracic or transesophageal echocardiography. In small neonates, recent micro transesophageal echocardiographic probes may facilitate intraprocedural guidance. Intracardiac echocardiographic probes (Acunav 8F catheters, Siemens) can be passed through the esophagus and may be an alternative to the micro transesophageal echocardiographic probe in very small neonates, even though the view is limited to single bicaval longitudinal plane only. The intracardiac echocardiographic probes don't have a thermistor and so are liable to get heated up if used for prolonged periods. In hybrid procedures, direct epicardial echocardiography may also be used to guide the site of puncture. Once a contrast injection through the transseptal needle confirms left atrial entry, the transseptal sheath is advanced into the left atrium. Heparinisation is done after confirming septal puncture. 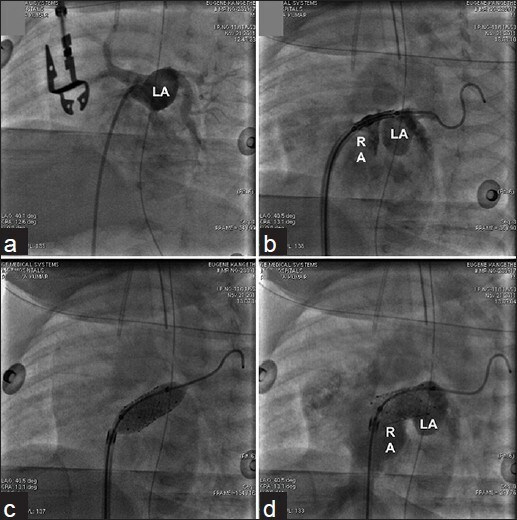 Since the size of left atrium is very small in hypoplastic left heart syndrome, a 0.014" coronary guidewire with floppy tip is advanced into the left atrium immediately after the needle tip enters the left atrium [Figure 2]. When the needle and septal sheath are advanced over this guidewire, an inadvertent injury to the roof of the left atrium and appendage is avoided. Once the stability of the position of the transseptal sheath is confirmed, the needle is exchanged with a 0.018" stiff torque guidewire like Platinum plus (Boston scientific Co) or Road-runner (Cook Medical) wire. In some situations, a 0.035" stiff torque wire like Magic torque (Boston scientific) wire is used. Pre-mounted stents are always preferred to avoid stent embolization. These stents are firmly mounted on low profile balloons in a very secure manner. Examples of such stents are Genesis (Cordis Inc), Valeo (Bard vascular), Formula (Cook medical), Visipro (ev3 medical), and are usually compatible through 6-7 F sheaths. Bare stents need mounting on larger profile balloons and carry chances of stent slippage. The stent is advanced completely covered within the transseptal sheath, when stent crosses the atrial septal plane. Since the atrial septum is often pliable, very high radial stress is not a necessary attribute for a stent to be deployed in atrial septum. 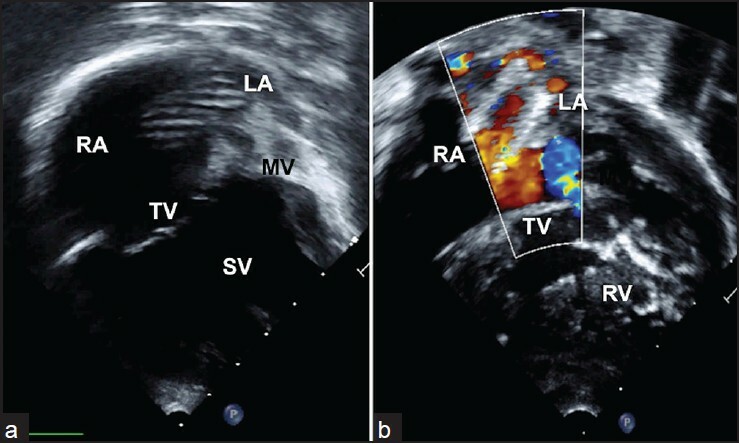 Prior echocardiographic evaluation before stenting of the atrial septum guides about anomalies of the caval vein like interruption of the inferior caval vein (necessitate a trans-hepatic approach); anomalous left superior caval vein with absence of left innominate vein (position the transseptal sheath in right jugular vein); thickness of the atrial septum (to guide the force needed for transseptal puncture); tunnel oval foramen (which needs to be avoided for placing an atrial septal stent). The distance available in the atrial cavity from inferior caval vein entry to the left pulmonary vein entry will guide about the length of the stent to be chosen. Marked stent protrusion into both these veins should be avoided. A thin aneurysmal atrial septum or multifenestrated septum should also pose serious problems for atrial septal stenting, however they are likely to be amenable for blade septostomy or static balloon septoplasty. Even though intra-procedural transesophageal echo will improve the quality of images, the esophageal probe will further compress the already compromised space in the hypoplastic left atrium. In some infants, the esophageal probe may compromise the airway too. Intra-procedural transesophageal echocardiographic imaging should be reserved only for difficult situations. Transthoracic imaging from sub-xiphoid windows may disrupt the sterile field, may give poor images in a hypoplastic left atrium and fail to show the oval fossa. But it is a valuable less expensive easily available imaging tool. Positioning of the stent across the interatrial septum is very crucial to ensure that the atrial septal tissue lies in the middle third of the stent. Echocardiography plays a vital role in this positioning. Once the stent is exposed out of the sheath by withdrawal of the trans-septal sheath into the inferior caval vein, the stent is partially deployed by minimal inflation of the balloon. A partially expanded balloon stent assembly is again carefully interrogated with echocardiogram to ensure that middle third of the stent is aligned to the atrial septum. 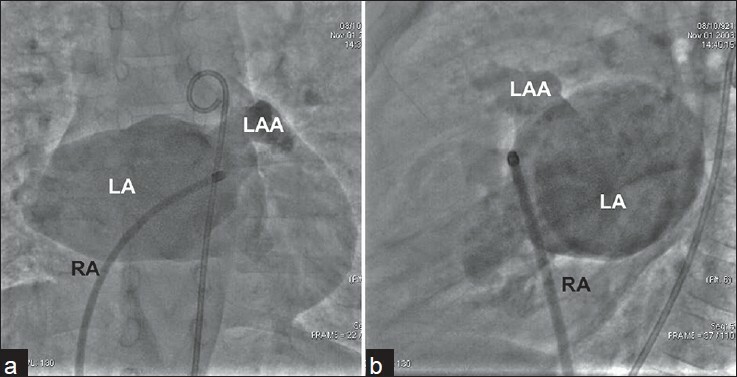 Once this is confirmed, a near total expansion of the stent is made leaving behind a small waist in the region of atrial septum to create a dog bone or butterfly appearance [Figure 2] and [Figure 3]. Hand inflation of the balloon gives more control than use of indeflators. Unsheathing the distal half of the stent within the left atrium and partially expanding only the distal left atrial end helps to obtain a stable dog bone or butterfly configuration. , Then this sheath-stent-balloon assembly is gradually withdrawn till the expanded left atrial end is caught and resisted by the atrial septum. This confirms the location of the middle of the stent against the atrial septum. Once this point is reached, the stent-balloon assembly is fully unsheathed. A small flush of contrast from the sidearm of the transseptal sheath will confirm the location of the stent in relation to the atrial septum. The stent is now expanded progressively till a small waist still remains in the middle. After stenting of the atrial septum, even though measurement of left atrial pressure by re-crossing the atrial septal stent with a catheter will give the accurate hemodynamic result of the procedure, there is a small possibility of displacement of the stent during such catheter manipulations. So echocardiographic evaluation including a pulse Doppler interrogation of the interatrial gradient is often preferred [Figure 5]. Due care should be exercised during withdrawal of the guidewire from the pulmonary vein for the same reasons. After achieving hemostasis, low dose aspirin is given till the next palliation. On follow up visits, echocardiogram should focus on the location of the stent in relation to the atrial septum, its stability, interference to the pulmonary venous flows, and interference to the inferior caval vein flows [Figure 6]. A longer stent might lead to erosions in the atrium, encroach into the pulmonary or inferior caval veins, or initiate thrombosis within the atrium. Perforation of the atrial wall by the septal puncture needle is common due to variations in left atrial anatomy. The thick interatrial septum often requires force to puncture the interatrial septum. As the left atrium is very hypoplastic, the needle tip tends to puncture into the roof of the left atrium or the left atrial appendage immediately after it enters the left atrium. Injection of a small amount of contrast will help to identify the location of the tip of needle. 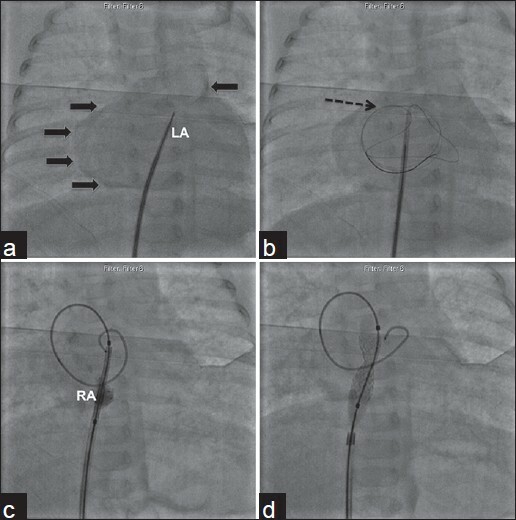 If the pericardial space fills on this injection indicating a left atrial roof puncture, the needle tip is withdrawn a couple of millimeters into the left atrium and a long 0.014" coronary floppy tipped guidewire is advanced into the left atrium [Figure 2]. Once this guidewire coils into the left atrium, the transseptal sheath can be pushed into the left atrium. If the left atrial injury is confined to a 0.021" Brockenbrough needle tip puncture, the resultant pericardial bleed is often contained and is unlikely to lead to tamponade. The puncture orifice closes off and so the atrial stenting can be completed in the same sitting. If the trans-septal sheath is advanced into the pericardial space, the resultant hemopericardium will be uncontrolled and compromise the hemodynamics. In patients where static balloon dilatation or blade septostomy fails to give a reliable interatrial communication, stenting should be done through a separate septal puncture. If stent is deployed on a previously dilated orifice, there is a major risk of embolization. Similarly, embolization is common if stent is deployed in oval foramen of tunnel morphology. An embolized fully expanded stent is often very difficult to retrieve out of the body in these small infants. It should be carefully brought down into the inferior caval vein and expanded between the levels of hepatic veins and renal veins without compromising the flows in both these veins [Figure 7]. Sometimes, the ends of the stent might protrude into the pulmonary veins or inferior caval vein; however, it may not cause hemodynamic problems. Thrombus formation on these stents is rare and possibly prevented by low dose aspirin. In severe pulmonary arterial hypertension with right ventricular failure, atrial septal communication will improve cardiac index (by increasing left ventricular preload), functional class, and may even prolong survival. Balloon dilated communications may close off on follow-up and lead to recurrence of syncopal episodes, thereby needing repeated interventions on this sick subset of patients. Stenting is advocated in patients with syncope; refractory or intolerant to pulmonary vasodilators, and as bridge to transplant. Atrial septal stenting is done in selected congenital heart diseases where left atrial decompression, inter-circulatory mixing, and maintenance of cardiac output are dependent on the size of the atrial septal defect. The size of the atrial septal communication will depend on the age of the patient, hemodynamic lesion, and whether partial or total left atrial decompression is desired. Embolization of the stent is the major bottleneck of the procedure and this is avoided by dog bone or butterfly configuration of the stent. This configuration is obtained by either echocardiographic or fluoroscopic guidance. Stenting should be avoided in tunnel oval foramens as they offer very little grip on the stent and lead to embolization. For the same reasons, stenting should be never done after a failed blade or balloon septostomy in the same septal orifice. A new septal puncture will give the best bed for deploying an atrial septal stent. Leonard GT Jr, Justino H, Carlson KM, Rossano JW, Neish SR, Mullins CE, et al. Atrial septal stent implant: Atrial septal defect creation in the management of complex congenital heart defects in infants. Congenit Heart Dis 2006;1:129-35. Atz AM, Feinstein JA, Jonas RA, Perry SB, Wessel DL. Preoperative management of pulmonary venous hypertension in hypoplastic left heart syndrome with restrictive atrial septal defect. Am J Cardiol 1999;83:1224-8. Holzer RJ, Wood A, Chisolm JL, Hill SL, Phillips A, Galantowicz M, et al. Atrial septal interventions in patients with hypoplastic left heart syndrome. Catheter Cardiovasc Interv 2008;72:696-704. Yalçın Y, Zeybek C, Onsel IO, Bilal MS. Atrial septal stenting to increase interatrial shunting in cyanotic congenital heart diseases: A report of two cases. Turk Kardiyol Dern Ars 2011;39:422-6. Prieto LR, Latson LA, Jennings C. Atrial septostomy using a butterfly stent in a patient with severe pulmonary arterial hypertension. Catheter Cardiovasc Interv 2006;68:642-7. Pedra CA, Neves JR, Pedra SR, Ferreiro CR, Jatene I, Cortez TM, et al. New transcatheter techniques for creation or enlargement of atrial septal defects in infants with complex congenital heart disease. Catheter Cardiovasc Interv 2007;70:731-9. Danon S, Levi DS, Alejos JC, Moore JW. Reliable atrial septostomy by stenting of the atrial septum. Catheter Cardiovasc Interv 2005;66:408-13. Moszura T, Dryżek P, Góreczny S, Bobkowski W, Mazurek-Kula A, Surmacz R, et al. Stent implantation into the interatrial septum in patients with univentricular heart and a secondary restriction of interatrial communication. Kardiol Pol 2011;69:1137-41. Seib PM, Faulkner SC, Erickson CC, Van Devanter SH, Harrell JE, Fasules JW, et al. Blade and balloon atrial septostomy for left heart decompression in patients with severe ventricular dysfunction on extracorporeal membrane oxygenation. Catheter Cardiovasc Interv 1999;46:179-86. Al Senaidi K, Al Mesned A, Coe JY. 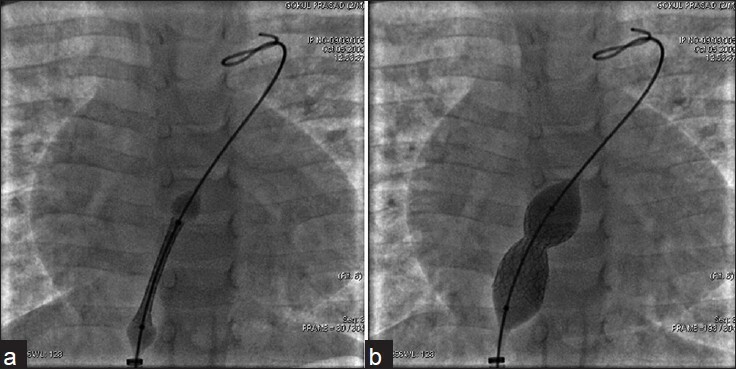 Percutaneous transhepatic stenting of a restrictive atrial septal communication in hypoplastic left heart syndrome. Catheter Cardiovasc Interv 2014;83:E269-71. Gossett JG, Rocchini AP, Lloyd TR, Graziano JN. Catheter-based decompression of the left atrium in patients with hypoplastic left heart syndrome and restrictive atrial septum is safe and effective. Catheter Cardiovasc Interv 2006;67:619-24. Mulla NF, Osher AP, Beeson WL, Kuhn MA, Larsen RL. Scoring system to determine need for balloon atrial septostomy for restrictive interatrial communication in infants with hypoplastic left heart syndrome. J Heart Lung Transplant 2003;22:883-8. Kim E, Sobczyk WL, Yang S, Mascio C, Austin EH, Recto M. Restrictive tunnel patent foramen ovale and left atrial hypertension in single-ventricle physiology: Implications for stent placement across the atrial septum. Pediatr Cardiol 2008;29:1087-94. Pavithran S, Natarajan K, Vishwambaran B, Arke AD, Sivakumar K. Preliminary evaluation of a microtransesophageal probe in neonates and young infants undergoing surgery for congenital heart disease. Ann Pediatr Cardiol 2014;7:173-9. Cheatham JP. Intervention in the critically ill neonate and infant with hypoplastic left heart syndrome and intact atrial septum. J Interv Cardiol 2001;14:357-66. Kalish BT, Tworetzky W, Benson CB, Wilkins-Haug L, Mizrahi-Arnaud A, McElhinney DB, et al. 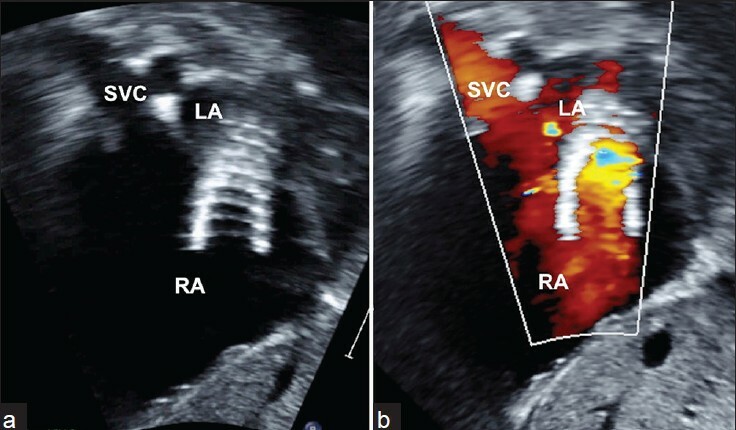 Technical challenges of atrial septal stent placement in fetuses with hypoplastic left heart syndrome and intact atrial septum. Catheter Cardiovasc Interv 2014;84:77-85.